It's hard to imagine that it's been only three years since the original iPad came out, since tablets were a part of our daily world. Sure there were tablet computers before, but there weren't tablets the way we know and use them today. And while the iPad changed personal computing forever, it has remained mostly unchanged—especially on the outside. That is, until now. The iPad has been the dominant large tablet since its inception. There are competitors, sure. Surfaces, Fires, Tabs, and Nexii have come and gone, but none has been able to unseat the iPad as a go-to 10-inch slab. Which explains, in part, why the iPad made it through four generations largely unchanged. It wasn't broke, so Apple didn't fix it. The iPad's real competition, it turns out, has come from a cadre of smaller tablets—including Apple's own mini. Every member of the 7-inch contingent is smaller, lighter, and more affordable than the iPad. It's that portability and design that the iPad Air is responding to. With the Air, Apple fights back against the Fire HD, Nexus 7, and iPad mini by co-opting the latter's terrifically trim design. Luckily for everyone, it scales fantastically. Up until now, the iPad's greatest triumph has been its functionality; it's a 10-inch tablet with a great ecosystem and a brilliant display that just works. But the previous iPad design was never particularly beautiful, with its monstrous bezel and kludgy curving back. It was a design that seemed more and more dated with every year it remained untouched, Apple more intent on beefing up guts than prettifying the exterior. The iPad Air acts as one massive corrective to those three years of stagnation. With sleek, skinny side bezels, and shiny silver chamfers like those we've come to love on the iPhone, the Air is hands down the most beautiful tablet Apple has made to date. Like an iPad mini, but more, and with a screen worth looking at. The sharper—but still rounded—angles on the iPad Air's back feel more deliberate, almost higher resolution, than the subtler, hazier slope of the previous iPad. For the first time the iPad's body exudes a sense of purpose, like it was designed to be beautiful in its own right, instead of primarily to hold whatever guts you need back there to make the screen work. The iPad Air is a full-sized tablet that's almost as lovely off as it is on, something that—until now—only the Surface had really gotten right. As its name suggests, the iPad Air is light. Very, very light. Almost magically light. At just one pound it is half a pound lighter than previous iPads or the Surface 2, and a third of a pound lighter than the Nexus 10. That's a relatively small difference on paper, but a world of it in real life. Consider this: The iPad Air is closer in weight to an iPad mini than it is the 4th gen iPad. The iPad Air is also incredibly small, at least for something so big. It's thin. Phone thin,it's actually a tenth of a millimeter thinner than the iPhone 5S. And with the monster bezel of iPads past trimmed down to the same skinny remainder you'll find on an iPad mini, it manages to be impressively small and impressively big at the same time. That, in and of itself, makes the iPad Air an absolute pleasure to hold, to use, to admire. It's a delightful contradiction that's unobtrusive enough to fade away into the background until you feel like admiring it. But the iPad Air is more than just a pretty face. While its svelte design is an accomplishment in its own right, it also serves to make using the iPad better in just about every conceivable scenario. You pick up the iPad Air and you think "that's it?" It's not the first time Apple has managed to pull this trick off, but it's never not impressive, especially with a device this big. Of course this isn't just some sort of party trick (though it is a great party trick), it's useful as well. Holding the iPad Air for long periods of time—in one hand, if you're into that—is way more practical than it's ever been before. Trying to grasp it landscape with one grubby paw is still going to give you balance issues, duh, but if you want to pinch the bezel and walk around with it like a touchscreen magazine, your wrist will be able to take it. I found myself strolling around to the kitchen, checking on dinner and coming back to the couch, all without having to put down the Lovecraft anthology I was plowing through on the Kindle app. That's something I do with a Nexus 7 all the time, but on a full-sized iPad it's a whole new kind of luxury, and so natural that you don't even notice you did it until after the fact. When you will notice, however, is if you take a step outside. It's possible to read on the iPad Air's screen in moderate to bright sunlight if your brightness is maxed out, but it's not advisable. It can be hard to concentrate on a description of indescribable horror when it's competing with a reflection of your stupid hair. Pinching on that tiny bezel is easier than it seems; like the iPad mini before it, the iPad Air (with iOS 7) is exceedingly good at telling whether your thumb is trying to click something or whether it's just gripping. If you start on the side and slide your thumb out from the bezel, you can smack your thumb in the middle of your Twitter feed or episode of Archer for a better grip all without disrupting what's happening on screen. It always feels just a little weird though. Like an error in your favor. What doesn't feel weird—finally!—is typing with two thumbs in portrait mode. With the reduced fat on the Air's sides, it's not only feasible but comfortable. That goes a long when when you're trying to get some stupid Facebooking done. All that would be impressive enough if the iPad Air managed to just match the performance of its predecessors, but no; the A7-powered iPad Air is screamingly fast, even with a giant screenful of pixels to push. Apps load up in a snap. Swiping between homescreens is a pleasure. Multi-task swiping from Twitter to Gmail to Netflix can show a liiiittle hitch without iOS 7's icon zooms to disguise the load, but once your apps are loaded up and in memory, they swap like a dream. And even visually intense games like Dead Trigger will run with the kind of performance that makes you forget that performance is ever a thing you have to worry about. All things considered, you probably don't even need the kind of processing power the tabs A7 chip provides (yet, anyway) but the kind of zippy performance the iPad Air provides is a nice little luxury, even if it's one you wouldn't necessarily miss if it were gone. And somehow, amid all the slimming down and speeding up, the iPad's battery life has managed to stay strong. We were able to squeeze more than 10 hours of consistent video playback out of the sucker. That's impressive on its own, but in more practical terms, it's easy to use the iPad Air—fairly frequently and heavily—over multiple days without having to plug it in. I moved all my light internet browsing and stupid YouTube video watching over to the iPad Air all weekend and made it out with some 45 percent battery on the other side. Beyond the slimlightness, the iPad Air offers stereo speakers, a first for the full-sized table. Unfortunately they are about as close as stereo speakers could possibly be, separated only by the lighting port. They offer up a little better sound than the earlier iPads did, but not by much. They're no slouch, but also no comparison to the "wait, where is that coming from" kind of pseudo-surround sound afforded by the Kindle Fire HDX. It's also slightly obnoxious that they're on the same side when you're watching old episodes of Street Sharks in landscape mode, and more obnoxious that it's virtually impossible not to cover them with your hands. For all the changes in the iPad Air, there are some holdovers. The screen is very pretty for instance, but you knew that already; it's the same 2048x1526, 264 PPI display that's shown up in iPads for nearly two years at this point. That's not to say it's aged—it's still a beautiful and more than enough for watching Bob's Burgers or trying to read Gravity's Rainbow FOR REAL THIS TIME—but it's not quite the leader in mind-blowing pixel density that it used to be. Even more budget options like the upcoming Kindle Fire HDX 8.9 are starting to beat it out, but the iPad has the advantage of having an absolutely beautiful physical device behind it, and an ecosystem that's unbeatable. Speaking of ecosystem, iOS 7 is, well, iOS 7. And while it has a slight tendency to chug a little on older devices, it does not here. So long as you've acclimated to your new icons, zoomy app-loading animations, swipe-up control panel, and all the other new tricks iOS 7 brings to the table, you'll find that using the iPad Air as an iPad is 100 percent identical to using any other iPad that came before. Sure, you've got some new flexibility to how you hold the thing, but all in all the improvements in size, shape, and speed don't over any real revelatory changes to how you use an iPad, or any 10-inch tablet. Watching movies and reading books and surfing the internet on a big pretty screen is still exactly that. It's comforting if not exciting. But hey, if it ain't broke. The iPad is finally beautiful in a way it never has been before. Its screen is (still) lovely to look at, and its body is lovely to hold. The iPad Air is lighter, faster, and smaller—a lot lighter, faster, and smaller—than any iPad that came before it, but almost miraculously without compromise. 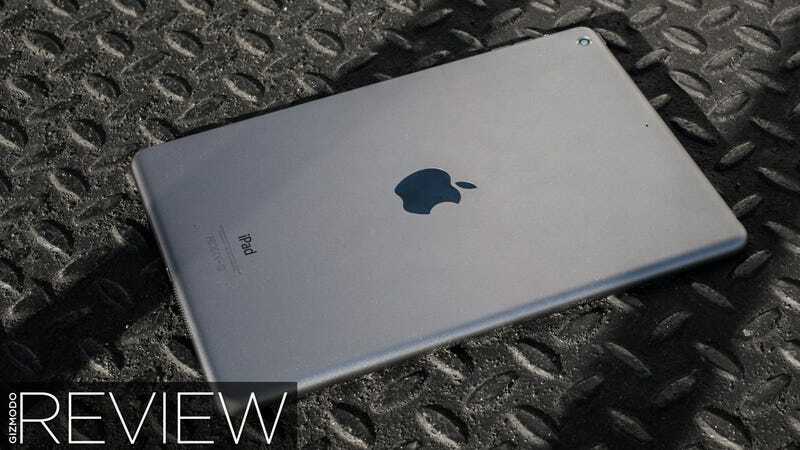 The iPad Air is just better, in every single way that matters and many more that don't. The iPad Air is by far the most lovely iPad to hold and the most lovely iPad to use. But duh. The iPad Air's almost absurd thinness is not without its drawbacks. It's far from fragile or delicate, but the Air does exude a certain subtle sense that you need to be more careful with it than with any previous iPad. I have never been more uncomfortable throwing an iPad in my bag. I worry about what I might bump into. I worry about tripping. Part of that is on me, sure, but those fears are not entirely baseless. The iPad Air gives small indications of its comparative fragility. Unlike its heftier predecessors, the iPad Air will vibrate rather wildly from the power of its own speakers. And tapping the iPad Air's screen sounds different than any other tablet. There's almost a sort of hollowness to it. From an engineering perspective it's incredible that this thing could feel like anything other than jam-packed full of guts. But from a practical one, there's a slight bit of unease you have to get used to. A finger on one side of the screen can feel the vibrations of another finger that's tapping on the far side. It's a uniquely unnerving sensation. At the iPad Air's best moments you think Goddamn, how did they fit a whole tablet in there? And at its worst moments you realize they barely did. If you're in the market for a new 10-inch tablet and you like you some iOS, then yes. This is the best tablet 10-inch tablet Apple has ever made, and the best 10-inch tablet on the market right now. At a starting price of $500, you're paying a premium over the competition. It's worth it. The only question—and it's an important one—is if you even want a 10-inch tablet. The retina iPad mini will be a hundred bucks cheaper, with otherwise comparable specs. Yes, it has a smaller screen, but in a lot of ways that's preferable. A discount and a bonus feature. Not to mention the world of fantastic $230 Android tablets like the Nexus 7 and Kindle Fire HDX if Android (or fake-Android) isn't a deal breaker for you. Likewise, if you've already got an iPad 4, or an iPad 3, you shouldn't feel rushed to upgrade. The iPad Air's slim body and blazing guts are wonderful, but neither is a big enough improvement that it's worth the trade-in for most people. The iPad Air is a marvel of technology. It's thinner, lighter, and better than any tablet of its size. More importantly, it shows that the iPad is capable of improving more than just its guts. It just happens to come at a time when you've never had more choices, from Apple and elsewhere—a lot of them cheaper, smaller, and with every bit as much zip.